One of the benefits of living in a new development surrounded by muddy lots and construction sites is that you get to pick through the "garbage" left behind by builders - including free landscaping boulders and scraps of sod. In fact, I sodded about 2/3 of my backyard with reclaimed scraps from waste piles by the curb - but that's another story. Today I wanted to close the book on my addiction to landscaping rocks: Huntin', gatherin', rustlin', haulin', and collectin' way more rocks than I need - and the story of my last* rock haul. These are my leftover landscaping boulders, just my 'extra' ones - aka my horde! My first rock from the lot next door... it's so cute! I want more! Not only did I like looking for rocks, I liked collecting them, hauling them in buckets and hording them in my garage. 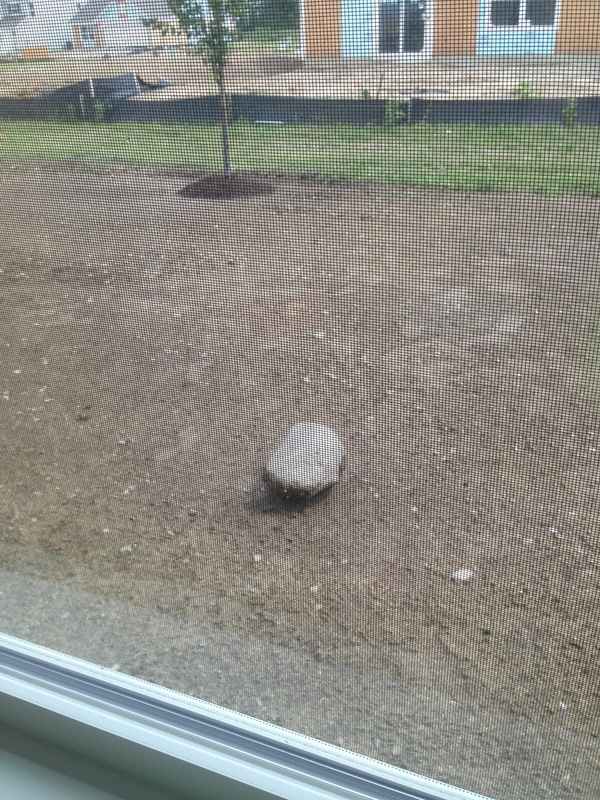 I figured I would get enough to use in my landscaping - free boulders for a feature in the backyard. Did I have enough? I could always use more. I put them in the front yard too. My collection in the garage was growing, and soon I had enough to build two little retaining walls in the back. Growing collection in my garage. That big one in the middle is now my moss rock in the front! I had to get more... more! 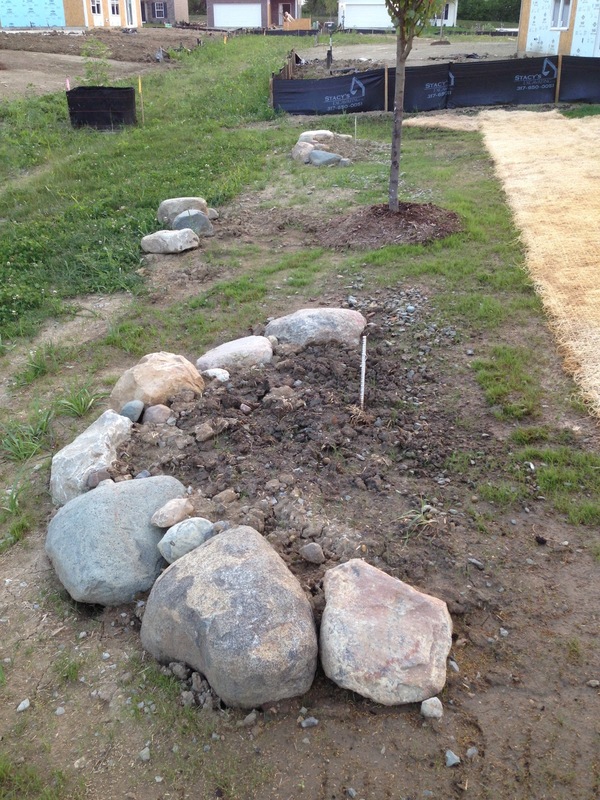 Next I guess you could say I went ALL IN with a truck load of large cobble stones to make a dry riverbed. I can hear the future realtor now... "why did they decide to put a rock pile in the back?" I'll cross that bridge when I come to it, but for now it's my dry riverbed (and it's a hit with my nephews who like to play in the rocks). My peanut shape feature in the back is so big you can see it on Google Earth. It's my own personal wilderness! My favorite rock rustlin' tool, the two wheeled dolly. This is the biggest rock I got using this method, and this one now sits in the bottom corner of my yard next to my hardy pampas grass. So you would think I had enough rocks, right? Well, there was this ONE rock that I hadn't gotten yet. I noticed a kidney bean shape of pink and orange granite poking through the mud. I kept eyeing it every time I drove past. I walked the dog near it on purpose just to go case the scene. I wanted that rock, I had to have it. Granite peaking through the mud... taunting me, I had to have it! I took advantage of the 50°F weather and went to check it out at about 12:30am. The ground was pure slop and the rock was about 6 feet off the road, just out of reach to stand on the solid curb. I went home to plan my strategy. I put grocery bags over my shoes planning to sink into the ground when I went for it. I brought a shovel and made my way to the rock. I felt like a HUGE creep walking around the new section of the development with a spade and a head lamp in the middle of the night. I was hoping that no cars would pass while I was doing the deed, but unfortunately 2 cars went by, probably wondering what the heck I was doing digging away in the middle of the night. The sloppy clay kept sucking the rock back into the ground. I could tell it was a manageable size, but it was suctioned in place. I went for it with both hands and rolled the rock toward the curb. Like a snowball, it gathered a layer of clay all around it as I rolled it. I went home and got a blanket and my trusty rock rustlin' plastic tub. I wrapped the rock in the blanket and put it in the tub. I had about 100 yards to carry it home, and had to stop 3 times on the way. My guess would be the rock weighed about 100-120 lbs. I put it down on the sidewalk a few houses and and ran back for my dolly to get it home the last bit. My wedding ring looks like the one ring from lord of the rings completely covered in a ball of clay. My spade fared worse, completely coated in about 10 lbs of clay from handle to head. I felt so bizarre, like I had a severed head in a box. Creepiness aside, I was also excited to be in possession of THE rock that I had been eying for literally months. I woke up like a kid on Christmas morning, excited to clean my rock and see if it was a gem or a lump. The clay was unfathomable! I used a kitchen spatula to help scrape the clay off the rock, tried running it under water, and ended up using a kitchen scrub brush to help get the clay off under a constant stream of water. Unreal! And what was the result? Did I get a beautiful granite rock like I was hoping for, or a lumpy 'dinosaur egg' as my dad calls the boring rocks. It looks like a winner to me! Great color, interesting shape! I'll take it! A rather interesting shape, not just another lump of gray. I think I'll turn the dark part down and leave the pink sticking out of the bed I'm putting against the back of my house. I think this rock is more of a feature rock and I'll leave the boring ones for structure. Win! Are you addicted to landscaping rocks? Does your husband or wife hate them as much as mine (lol)? Do you think I'll be able to call it quits after getting this "one that almost got away?" Leave your comments below and let me know.